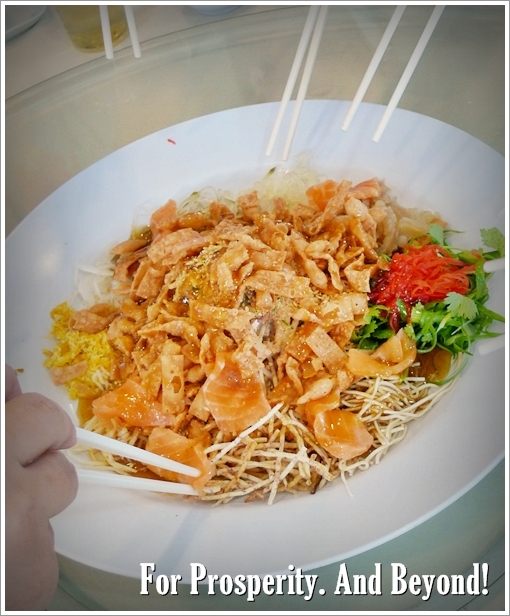 The very basic/standard/generic/traditional Yee Sang – But we were not complaining though. After all, this Chinese version of a prosperity-laden salad is supposed to be tossed for the notion of it, rather than for its gastronomic value. Unless of course, you’re taking into consideration the many varieties of modern Yee Sang with abalone and such. After two gastronomic feasts at Shanghai @ JW Marriott and Zing @ Grand Millennium, it’s probably time to set the mood back into place; and toss some Yee Sang the traditional way. This Chinese restaurant situated in Paramount Garden holds probably decades of legacy, judging from the outlook and the fact that the moment we entered and were seated at our reserved table; a warm, deja vu sensation washed over me. 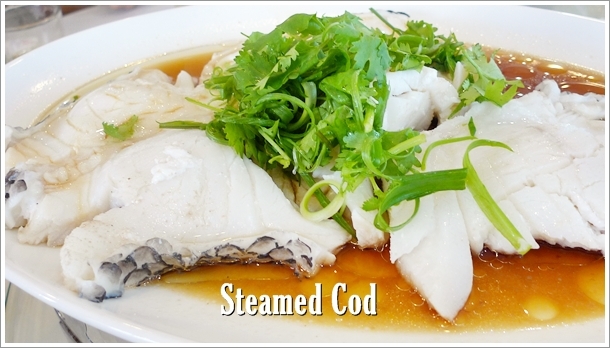 A kick back to the old school type of eateries; laid back, no fuss, no frills Chinese diner which was possibly once THE place to organize a banquet dinner, but has since relented to the fad (or maybe not?) of lavish celebrations at 5 star hotels instead. Comparing Gold Dragon City to Mun Choong, Oversea or even Tuck Kee (yeah, a post to come after our Reunion dinner next week!) would be more fitting, and definitely in the same league since those Ipoh restaurants mentioned above are nothing but serial old players STILL attracting a constant stream of customers. Initially, this lunch with colleagues was planned for dinner; but given the time constraints and logistic matters, we rescheduled to lunch hour instead. Saves time actually, since our office is located merely minutes away from this restaurant at Paramount Garden; opposite of Giant hypermarket. 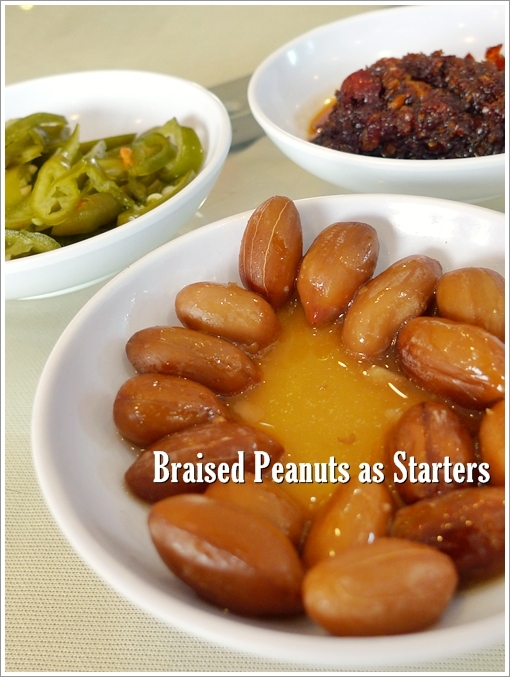 Conventional starters or tidbits provided at Chinese diners include – peanuts, peanuts and more peanuts. Occasionally you do get pickles (papaya, especially) or even ‘kacang putih’ (read Buntong’s post to see what the snack is), but at Gold Dragon City, they gave soft braised/boiled peanuts. Not a bad choice, since I prefer softer peanuts to crunchy ones myself. 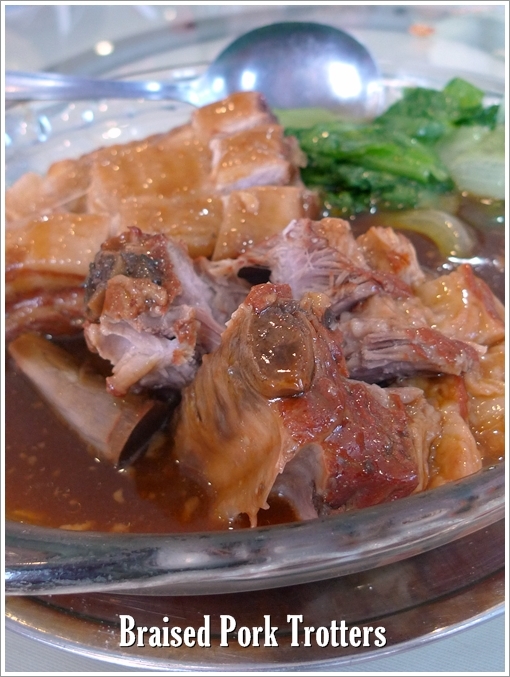 As the year draws close to a curtain call (Lunar calendar, of course), almost every Chinese restaurant in Klang Valley has been cashing in on this festivity. Menus with lots of 8’s (price-wise, of course) peppered all over the media; with hotels aggressively pushing various packages to the discerning diners. I guess cooking at home ain’t very fashionable these days, given the last minute rush to seal the deals, shopping for clothes and of course… caught up in jams. Tender, flavourful yet fell short of the fell off the bones texture; the Pork Trotters came with ample amount of gelatinous fat for complete collagen supplements for the dire days. Not memorable enough in my books, but good enough to go with white rice. Healthy, Hearty and Delicious; the brocollis, enoki mushrooms and shiitake mushrooms combination was a delight to be savoured. 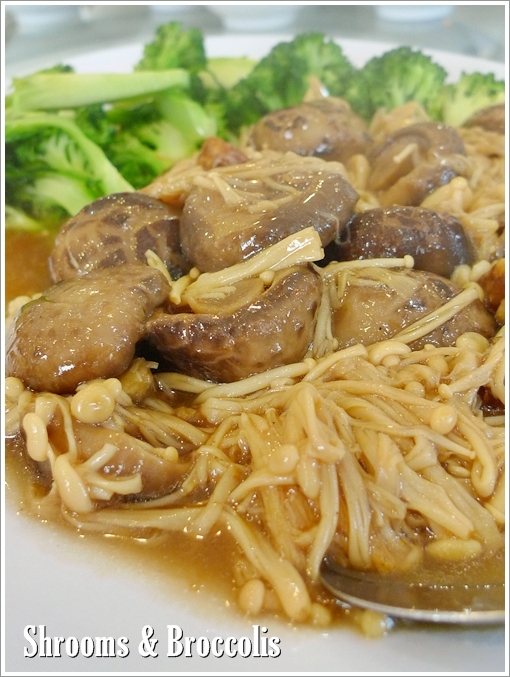 Can’t go wrong with mushrooms during CNY, and was I glad that they decided to leave sea cucumber out of the mix. Hands down THE dish of the day, the roasted suckling pig came with razor sharp fangs and all. Crispy skin with a melt-in-mouth layer of fat underneath, and quite a hefty amount of meat beneath. Not bad, just barely enough to go around the table of 10’s. 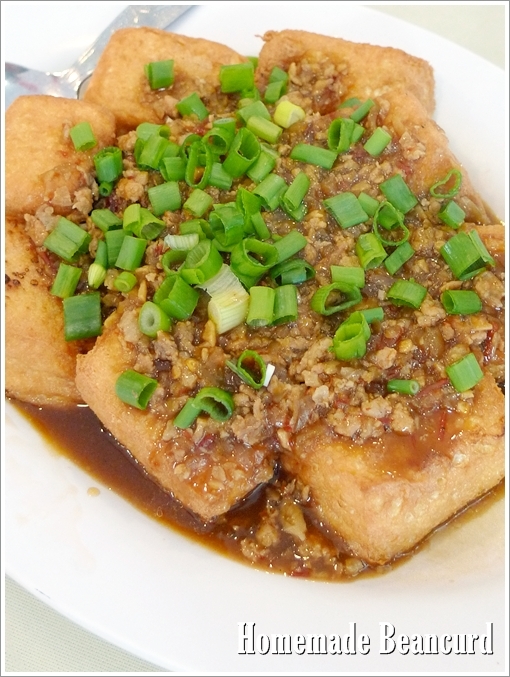 Signature Homemade Beancurd with Minced Meat – Very homely, and very basic. A little oily, no thanks to generous addition of shallot oil, but the velvety smooth beancurd was delicious. 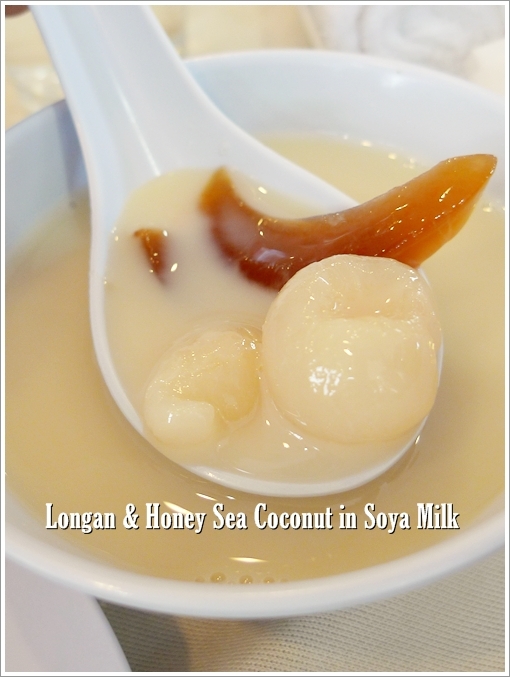 Dessert of milky soya bean with canned longan and honey sea coconut. Something more substantial than the usual clearer syrup, the combination actually worked wonders. That is, if you have a sweet tooth for desserts. Yeah, the dishes were all ordered ala carte, based on what the colleagues preferred from the many meals they have had there. It’s my first time there, so I kept quiet and let them work their magic. 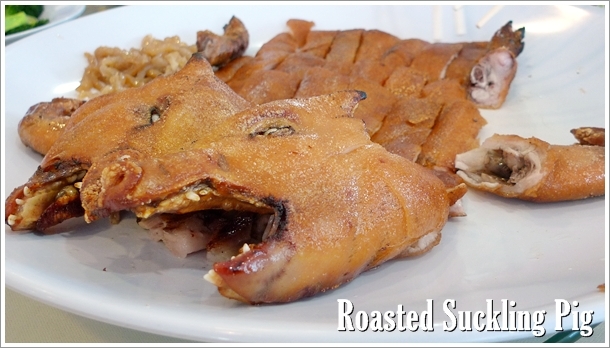 the roasted suckling pig looks scary ler…but the skin sure looks crispy. Yeah, forget about the fangs, just dig in into the body. that suckling pig must be a imported one-if it is a local one, the teeth are clipped at day one. Oh ….. really? Do people import suckling pig here in Malaysia? Wow!! So many lou sang already??? In hopes of prosperity. And more. Erm, I have GOOD knees! Hahaha … nolah, just that not a fan of those slimy creatures. when you hold the live sea cucumber it will grow longer and longer in ur hands. it’s so geli. they have a lot of tiny ‘legs’ that will stick to the base of whatever they can grab so that people won’t pull them easily. and pls do not press it, they will spurt sticky stuff out. ewww…. Oh this is cheap, classic and no frills. some excuses to lament about! Not awful lah… just not in luck to grab some. Yet. Went to this restaurant last year for a friend wedding dinner. Food was good so i decided to return some other day. It happened that last night my whole family went back Gold Dragon City Seapark. Food is terrible now, Roast suckling pig over burnt, Fried lemon chicken stinks. And guess what the manager said when we complain. He said food is like that, if change dish scare chef scold. Stupid fella don’t know do business. Damn expensive somemore cost near to RM500. For me its the 2nd and the last time i be eating in this restaurant. Good move, Andy. No manager should act unprofessionally like that. Please don’t go to this restaurant as the staff are really rude & bad service.